There's no secret formula to style. So embrace delicate colors in a bold setting. 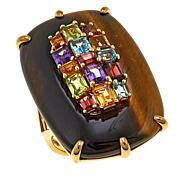 This multi-gemstone ring flaunts a framed kunzite that uniquely enhances your signature style. 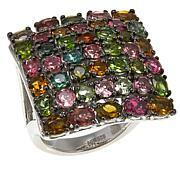 This ring could easily be right in there with Margot Mckinney jewels! My disappointment is w/ HSN, it was an obvious return, dirty nor securely packaged! It is as others say sort of lacking in sparkle in the dark but in the outdoor light it comes alive.. the kunzite stone alone is a very fair price for the color, clarity & cut... you have to appreciate the art of jewelry design & jewels in general to really appreciate this unique ring. I'm always leery about buying kunzite b/c it's usually much paler than it appears on screen or in a video. This one, however, is perfect. 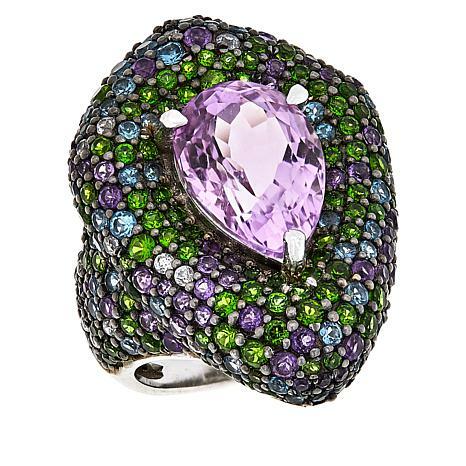 The scattered amethysts among the valuable tsavorite stones makes this ring even more valuable in my eyes and it's definitely a winner. The Kunzite is a great lavender with such sparkle looks like a diamond! Breathtaking and comfortable. I have a size 8 and it's TRUE to size on ring finger. The bright greens and blues are phenomenal as they catch light it's like they're on fire. 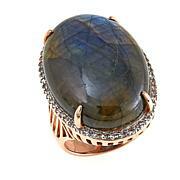 Great price for a gorgeous luxurious ring! Thank you Carol for Rocking this one! I have gotton so many women stopping me to take a real peek at it. And everyone loves it. 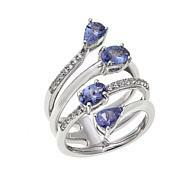 I am sorry the other buyer did not like it but I find the ring to be gorgeous. This is a ring that definitely needs light to light up and it is not like black spinel that will sparkle even with minimal lighting. But once the light hits it all the colors become alive. It is a very large ring so it is not for the faint of the heart. I am 6 tall so bigger is better for me and this is breath taking.